Where are all the young Democrats? I spent a week in Denver to, among other things, join the celebration of grandson Julian's first birthday. We celebrated grandson Kace's first birthday last month in Aberdeen. As I ponder the futures of the two boys, I find a nagging hope that Kace can find his way out of South Dakota. The state has no future because of the state of its present. And it has worked toward its present state for a century. In the past decade, however, it has made a decisive commitment to matters that seem to insure a bleak future. The prevailing attitude toward education is the tip of an iceberg of denial and ill-will that seems to be emerging as the essential character of the state. Monday morning after some e-mail exchanges with her friends, my wife gave me the news that her former boss, Stephanie Herseth Sandlin, has announced that at this time, she will not be running for any public office. She joins another very talented young person, Brendan Johnson, in declining to run for office. Actually, their decisions may be the best hope in working toward improvements that could return South Dakota to a viable state which can produce a future. In the announcements that they will not seek public office at this time, both Stephanie and Brendan commented that they wish to devote their energies and efforts to their present positions outside of politics. Brendan Johnson is the state's U.S. attorney who has made great strides forward in reconciling and coordinating federal and tribal justice systems. The dominant attitude of South Dakotans toward the native Americans is a cultural malignancy that has done severe damage to the state. Stephanie Herseth Sandlin has stated that family is a big consideration in her decision, but she gave equal emphasis to her job with Raven Industries, a leading corporation centered in South Dakota. I do not to presume to know all the factors considered in their decisions, but I do know their backgrounds and know that both are people whose decisions would not include any of the provincial exclusions and hate-based discriminations that have become issues in the state's political dialogue. Even if a person opposes those exclusions and discriminations, they become issues forced upon them during campaigns, and they divert attention away from the issues of creating a future in the state which addresses matters of liberty, equality, and justice. And opportunity. But South Dakota is mired down by prejudicial, bigoted attitudes, and people who want productive and contributory lives come to the realization that they must either move or resign themselves to hoping that they can make changes that make such lives possible. That latter option is clouded by the reality that the prospect of such changes has become increasingly remote of late. Most significantly, the demographics of the state, as reflected in its recent elections to state and federal offices, have made politics an unlikely vehicle for change. In 2010, when the South Dakota Democratic Party needed a candidate to run against John Thune for U.S. Senate, party supporters asked a number of officers to work at recruiting some good candidates. I was among those, and had the opportunity to interview some very qualified and capable young people. That was a time when I was confronted with a reality about the prospects of South Dakota. The people I talked with had reviewed the possibilities and found that engaging in state politics could be lethal to family life and to any aspirations to lead a mindful life. They thought that exposing their families to the kind of defamation and denigration that the John Thune campaign used in 2004 would be unconscionable, and they could not see how it would be possible to do anything constructive in a political environment seething with provincial malice. The people I talked with seemed to have a consensus that anything good for South Dakota would have to come from outside the political arena. Brendan Johnson and Stephanie Herseth Sandlin have both serious demerits against their candidacies: they both hold degrees from prestigious universities outside the state--in the east. Herseth Sandlin went to Georgetown U. after graduation from Groton High School on a scholarship. She then obtained a law degree from there. Brendan Johnson moved to Washington, D.C., from Vermillion, when his dad was elected to Congress, for his high school years. He then returned to graduate from the U. of South Dakota. But then, he obtained his law degree at the University of Virginia. Woops. Accomplishments in academics and professional life outside of South Dakota are lethal, particularly if those places carry the aura of prestige. Many South Dakotans hate accomplishment and performance that exceed anything that might raise the level of expectations in South Dakota. The GOP has been successful in fanning that resentful sense of inferiority into a political rage that wins elections. If you hold degrees from institutions that demonstrate excellence and you manage to accomplish things in high places, you have committed the unforgivable sin against South Dakota. Unless the state needs someone of such attainment and accomplishment to go to Washington to bolster the federal subsidies on which the state depends for its existence, it will not elect such a person to Congress. Any smart potential candidate must consider how their accomplishments and experience will be regarded in South Dakota, and how such a background might be contrived as defamation and abuse against them and their families. Such potential candidates must also think seriously about how they can represent the people who are committed to resentment and hatefulness to the nation. Does one really wish to be obliged to these kind of people? Of course, successful politicians must deny or ignore the presence of the ill-willed and malevolent among their constituents. To those who wish to build a sustaining culture and a nation of true liberty, equality, and justice, politics does not offer much opportunity for service. And so, many young Democrats opt out of active participation. And there is the matter of opportunity in South Dakota. The Governor actually went to the Mall of America to try to recruit young people to the state. There are number of groups touting life in South Dakota and attempting to lure young people to return. I spent the past week with a large number of young people who have left South Dakota. When telling them of the efforts to lure young people, the inevitable reply is, "To do what?" One of the emigrants said it was her intention to return, but after the elections of 2004 and 2010, she said the state showed an aspect of life that is simply too discouraging. She is among those who started her education in the state, but finished out-of-state. She said there is no opportunity in the state to use her degree, and the fact that she earned hers out-of-state would always be a demerit. She will build her life where she has opportunity to do so. Jobs are by no means the only factor young people consider. The culture and the opportunities it offers to pursue talents and interests are limited. Stifling. Often absent. Where denial is a way of life, there is very little life. For years, my job was to assist students in gaining skills, honing talents, and providing them with some knowledge of the larger world. It was an assumption that most of those students would move out of state to find and pursue their lives. That is not to say that there aren't talented and accomplished people in South Dakota, but they live in cultural enclaves where they find encouragement and appreciation. In many cases, their activities are aligned with other places. Supposed political observers keep telling the Democrats they have to do something different if they are to remain a viable party in South Dakota. They haven't observed carefully. They haven't observed the fact that intelligent Democrats, young and old, are doing something different. They are not investing their lives and futures in a political process that does not work and cannot work under current conditions. They are expending their efforts on jobs, better educational opportunities, and families. South Dakota politics is a casualty of the culture wars. Democrats have by no means given up on the principles of their party. Like the members of the Occupy Wall Street movement, they pursue those principles in quieter, protective ways. You won't find their efforts reflected in the news media or in political blogs. And you won't find them in political forums. Politics in America has reached a state of hopeless dysfunction. This is the one area in which South Dakota can claim to be a true leader. People continue to carry forward the work of building America, but their America is not reflected in any of the precincts of corporate fascism. In the meantime, we make provisions for Kace to live in a society that has abandoned South Dakota for now. It is a story that any community that promotes economic development should know and understand. It is not an uplifting story. In January, Northern Beef Packers announced that it had its financing in order and was set to increase production in its new Aberdeen plant. In late April it announced it was laying off 108 employees because it did not have the finances to purchase enough beef to continue production. On August 8 of 1997, Smithfield [Foods] purchased the Dakota pork-processing facility in Huron, South Dakota [Dakota Pork Industries]. The plant employed 750 people, slaughtered around 7,000 hogs daily. It was Huron’s largest employer and one of two South Dakota markets for slaughter-ready hogs. One day later, on August 9th, Smithfield shut down the Dakota pork plant, laid off the 750 South Dakotans who were employed there. In 2005 Huron was chosen as the site for a turkey processing plant that was implemented through the efforts of Hutterite turkey producers. At the same time, Ridgefield Farms, a Connecticut-based company, proposed setting up a beef processing plant to take advantage of the infrastructure being put in place to accommodate the turkey plant. Plans for the beef plant, which was supported by the state economic development office, faltered. Ridgefield announced plans that it was moving its proposed operation to Flandreau. After getting $850,000 in local economic development money and support from Farmers Union Industries, it canceled all plans in Flandreau. In September 2005, incorporation papers for Northern Beef Packers were processed for an Aberdeen-based corporation led by a local sales barn owner, who is no longer associated with the scheme. The proposal survived zoning disputes, constant financial problems, some very bad planning and execution, and opposition from a group that did not want people of different races coming into the community to work. As construction progressed, lt had millions of dollars of mechanics' liens lodged against it for unpaid construction bills. The proposal found some financial backing from Chinese and Korean investors under a government program, the EB-5 Program. Through this program, foreign nationals can obtain a green card to reside in the U.S. by investing a half million or more dollars in a U.S. economic development project. The company also had some unsold Tax Increment Financing bonds that it eventually sold. In January, NBP seemed to think its financial difficulties were over. Its press release stated: "The company has hired over 350 employees to date, and will continue to grow its skilled workforce to over 500 employees in the weeks ahead as production continues to increase. At full capacity, the processing plant is capable of harvesting 1500 head of cattle per shift, resulting in more than one million pounds of boxed beef and offal products produced every day at the facility." In late April, it announced its latest financial difficulties and the layoff of 108 workers. A local press account says it had 420 employees before the layoff. The company says it needs to raise $20 million to resume its production. Northern Beef Packers is trying start up a business in which 80 percent of beef production is controlled by four huge packers. What the company has going for it is that it is located in the center of a high beef raising area. Huge confinement feeding operations are coming under public scrutiny because of the use of anti-biotics and other chemical agents in the production of beef. The demand for beef that is grown in a natural, healthier setting, and that can be tracked from birth to prime cuts is increasing. At some points in its development, NBP has included these considerations in its planning. From that standpoint and the fact that it can save money for regional producers on the cost of shipping cattle to market, it had an attractive, feasible plan. With the competition of the nature it is, a major factor is marketing. To get the company up and running, it has to have stores who want to buy and sell its product. That means either having a strong in-house marketing force or being part of a marketing program to which it can supply a steady and growing supply of beef. You can't run a beef processing plant unless you have some place to sell your beef. Over the years, NBP has announced a number of plans and alliances with marketing groups. Its latest scheme is to serve the Asian export market. A fact of business is that if you have a market to sell your product, getting the financing to buy the raw materials is seldom a problem. Lenders are eager to provide loans to businesses that have a market for their products. The big question for NBP is, who will buy its beef? As the editor of the business section for a newspaper, there is something I and other business reporters know that the news media never talks about. That is that many, many businesses are badly run. And there is a lot of voodoo business theories coming out of MBA programs that promote entrepreneurship as the practice of cutting costs and complaining about taxes and regulations that keep business honest and the environment clean. Business is not rocket science. Or any science. A person who can develop a competitive product or service and deliver it is a business person. Yes, they have to learn to manage costs, but their main task is to serve a market, if there is one. The worship of anyone who comes up with some kind of business scheme as an entrepreneur is a corporate-induced bit of foolery that the media has helped to spread. State and local economic development organizations tend to welcome anyone who claims an interest in starting a business as a potential savior. They do this without knowledge of the personnel involved, the business plan, or whether the business has a viable market for what it produces. In the case of Northern Beef Packers, it had some strengths. It offered an alternative to the trend of consolidation that is affecting agriculture and the entire food business. It has the potential to be part of a local economy. Mergers and acquisitions into huge companies nearly always mean reduced quality of product or service, monopoly markets, and reduced consumer choice. Northern Beef Packers also had some deficiencies. The floundering company indicates the lack of coherent and well-articulated business plan. The fact that after announcing it had its financing in order it then announces it doesn't have enough money to buy beef is an indication of a company that simply does not know what it is doing. And yet it has had the backing and promotion by state and local agencies. And that is cause to question if those agencies know a good business proposition from a bad one. For Aberdeen, the question is whether NBP can sell beef or if there will be another empty plant sitting for sale to join a number of other empty buildings throughout the town. 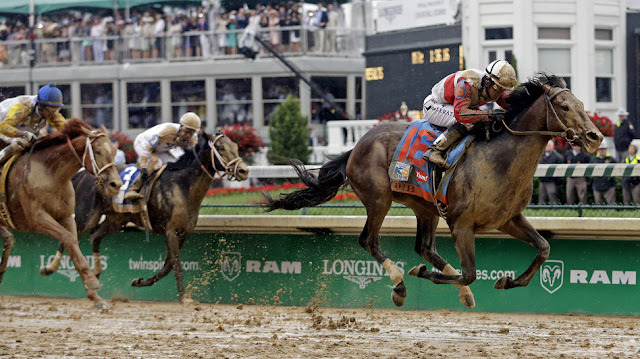 Orb at the Kentucky Derby: Ran the mile and a quarter race in 2:02.89 in the mud. Did his usual tactic of moving up from the middle of the pack in the second turn to blaze past the field to win. My parents, as were most parents of people of my generation, were stern about labeling other humans as freaks and responding to them with anything other than respect. 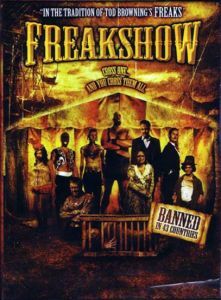 In my youth, carnivals used to come to town, set up a midway in some outlying pastureland, and pull the curious in by hordes, particularly to the freak shows. Our parents would shame us for expressing any desire to see them, and maintained a there-but-for-the-grace-of-God-go-you stance. They made clear that people who gawked at people with strange differences were among the lowest of the low. That did not deter many from availing themselves of chances to gawk at and ridicule people with those differences. It became a matter of a community outcry when I was working for the town newspaper. Our community was the site of a huge state mental hospital. Most of the hospital caregivers were African Americans. Every year the hospital had an open house on a Sunday afternoon that gathered a large attendance. And every year, a reporter and photographer was sent out to cover the event, which the hospital administrators regarded as a community relations effort. The photographers were forbidden by hospital policy to photograph any of the patients. This prohibition covered up something the the black caregivers were offended by and complained about to the pastors of their churches. Visitors to the open house would sometimes come for the purpose of watching and making fun of the strange behavior of the some of the paients, sometimes even goading them on. The caregivers related this kind of disrespectful and abusive behavior to their own experiences with racism. Rather than jeopardize their jobs by complaining to the hospital administrators, they expressed their concerns to clergymen, who brought the matter to the attention of hospital administrators and community leaders. Through some sermons and some letters-to-the-editor, the matter became a public issue. One of the pastors remarked in a newspaper column that the event was designed as an opportunity for the public to become acquainted with how some of the less fortunate people were being cared for, but many regarded it as a freak show. The event was canceled and instead opportunities for interested public to take guided tours of the hospital were offered. Not too long after, the hospital was closed and patients were "mainstreamed" into the community. 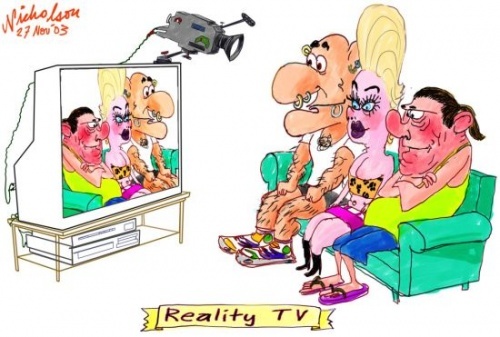 shows that appeal to that need for people to watch others debase themselves. The appeal seems to be that everyone needs someone to feel superior to and make derisive fun of. It started with the displays of the stupid, mean Jerry Springer show, and now pervades television in the so-called reality shows. That is not to say that Christ never called anyone fool. In a parable, he has God calling a man driven by greed a fool. (Luke 12:13. Martin Luther King, Jr., gave one of his brilliant sermons on this text.) The principles laid out by Christ have been accepted as the principles of a just and equal society, and making "freaks" of other people is an act of self-degradation. But avoiding derisive contempt for the unfortunate does not prohibit one from recognizing abject foolery among the fortunate, as Christ did in his parables. I hesitate to call anyone a fool, although I encounter people who qualify constantly. There are people out there so immersed in self-righteousness borne of malice toward anyone who does not subscribe to their brand of ill-will and disrespect that there are few other words adequate to describe the state of their human condition. Madville Times notes one such example which demonstrates how the blogosphere has attained the aspects of a freak show. Some people display mentalities on the blogosphere that inspire derisive contempt. The insult and abuse and perverse falsehoods through which they regard other people suggest that they are among those unfortunates whose attitudes, words, and actions verge into the freakish. It imposes on one the question of whether they should be regarded with compassion like village idiots, or if they have consciously chosen to be the way they are. On the surface, these people seem to be everyday rinktums, but on the Internet they turn into blazing assholes. For those who feel the need to point and giggle at poor floundering creatures, they need not seek out the circus or devious tours of a funny farm. They need only go to the Internet. Furthermore, the derision and contempt is often well earned. The New York Times Account. Melissa Hoppert: Won the Spiral Stakes, which was Animal Kingdom’s major prep victory before winning Derby. Don’t expect Black Onyx to do the same. Joe Drape: Long shot was working well, but lost all chance when he ended up with the worst post. MH: Do not count out two great racing veterans, Lukas and Stevens. JD: Looks as if horse peaked in March rather than May. MH: Overcame troubled trip in Withers, then held on in Louisiana Derby. No. 3 post is perfect spot for Calvin Bo-Rail. JD: He has had trouble breaking from the gate, but has trained well and will be running late. MH: Finished fourth in Louisiana Derby. Just don’t see him as a threat. JD: He’s won once — back in December. MH: Troubled trip in Risen Star, but showed in Wood that he can run. Been training well at Churchill. JD: Late charge into a crawling pace looked good at Wood, but his only victory came in November. 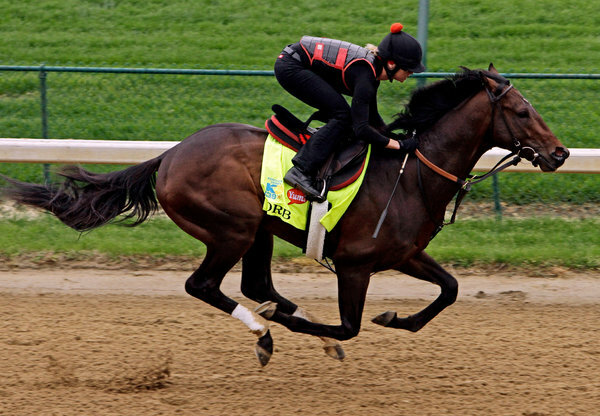 MH: Almost beat Revolutionary in Louisiana Derby, and Napravnik and No. 6 post are on his side. But is he good enough? JD: He has a sprinter’s pedigree and will be staggering down the stretch. MH: The final addition to the field. Finished third in the Spiral, but probably doesn’t belong. JD: No shot. MH: Showed his mettle in Santa Anita Derby. With his speed, he has a shot. JD: Can he stalk and pounce? Can his rider stay focused in his first Derby? Many questions. MH: Cruised to 4 1⁄4-length victory in Arkansas Derby, but Vyjack easily dispatched him in Gotham. JD: He’s a quality colt and has looked good since arriving at Churchill. Arkansas Derby was slow, though. MH: Finished second in Blue Grass two weeks after troubled trip in Louisiana Derby. Has had chance to break through. JD: This one has gotten better every race, sort of like his daddy, Curlin. He’s green but dangerous. MH: Nice win in the UAE Derby in Dubai, but he just got to Churchill and has never won on dirt. JD: He’s bred for the dirt and the marathon distance. MH: Set track record in Holy Bull and looked solid in losing to Orb in Florida Derby. Has been thriving since he got to Louisville. JD: The stalker is fast, fit and seasoned. Say hello to your Derby winner. MH: Third in Tampa Bay Derby, but he’s going to be lost against this field and at this distance. JD: This speedster will set the pace, but little more. MH: Undefeated colt was finally tested in Wood and prevailed. Has not been very impressive in Churchill workouts. JD: Can he get the mile-and-a-quarter distance? His daddy, More Than Ready, could not. MH: Third in Blue Grass, but again, has never run on dirt. Must be exceptional to make the switch; he’s not. JD: Strong closer, but this is a tough place to make dirt debut. MH: Found stride at Gulfstream, winning Fountain of Youth and Florida Derby. The talk of the backside, and with good reason. His race to lose. JD: He’s won four in a row in impressive fashion. But too many have already declared him the winner. MH: Has not run since winning Rebel on March 16. Don’t think he will regain that form. JD: Hall of Fame trainer has won this race four times. No fifth this year. MH: Second in Arkansas Derby. If the track is muddy, his chances go up, but only slightly. JD: He has won before at Churchill, but I’m not sure that’s enough. MH: Catapulted into Derby picture in thrilling fashion, coming from last to win Blue Grass. But was the performance a fluke? JD: He closed spectacularly in Blue Grass, but looks like a turf horse. MH: Gelding put up a fight in the Wood and has only one loss. But all his races were at Aqueduct, and he drew an unfortunate post. JD: Hasn’t trained well and drew poorly. Little chance. Korea has Kim Jong-un. Iran has Mahmoud Ahmadinejad. The United States has Wayne LaPierre. They all have their loyal followers who seem to draw comfort and self-esteem from the belligerent crudeness and unstable mentalities the leaders demonstrate. These leaders all brandish and threaten with weapons and accuse the U.S. of plotting to take their weapons and rights. And South Dakota has its group of malicious bloggers, whose juvenile malevolence is a malignant growth on the state of the kind that Kim Jong-un and Ahmadinejad are to the world. They are sustained by followers who support them with callow belligerence. about making false accusations and peddling outright lies to keep their followers in a state of angry agitation. In the case of the NRA, it has bullied and cowed political leaders, including members of the Supreme Court to accept a reading of Second Amendment that refutes the historical facts behind it and the linguistic analysis by actual scholars of language that trace its intention. The dangling clause A well-regulated militia being necessary to the security of a free state is unclear about the way it is supposed to modify the main assertion of the amendment the right of the people to keep and bear arms shall not be infringed. 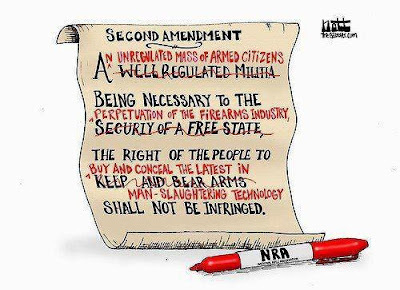 The NRA has chosen to simply ignore the introductory clause and insist that the Second Amendment prohibits placing any kind of restrictions or limitations on what kind of weapons may be possessed and how they may be used. But in the current debate on gun control in which many of the claims are blatant fabrications (lies, if you will), the gun lobby is whining in wounded indignation that it is being accused of promoting the mass murder of children. I have heard no one making the accusation quite that bluntly.The accusation comes from a logical inference regarding the absence of gun regulation that the unbridled access to arms provides a means for the maliciously demented to shoot down children. The gun lobby's shrugging off of the killing of 20 first-graders, to say nothing of the six adults, at Sandy Hook is to many people a grotesque symptom of a nation suffering from serious, potentially lethal, intellectual and moral decay. The issue is further defined by the fact that a 9-year-old was killed when Gabby Giffords was shot and a 6-year-old was killed in the Aurora movie theater massacre. Murders of children are the price of freedom, according to the NRA book of wisdom. America has created the conditions that make mass shootings and the mowing down of children a frequent occurrence. The U.S. has the highest rate of gun ownership in the world with 270 million guns in the possession of citizens, or 89 firearms per 100 people. Guns are the instrument of death for 25,000 people a year, In 2010, 19,308 died from suicide by gun; 11,015 were murdered by gun; and 600 died from gun accidents. That's the price of freedom. More than 90 percent of Americans are in favor of background checks as a step for keeping the mentally unqualified and confirmed criminals from buying guns over the counter or other venues in which such sales are preventable. The gun lobby gets hysterical and says this is an infringement on the right and the beginning of measures to confiscate all guns by the government. The big lie is that the government is conspiring to gets its hands on everybody's guns, but the cowering masses like to believe it so. No, the gun lobby has never been accused of promoting the killing of children. But if you want to demonstrate your dedication to freedom, go and kill a kid today. It will send a message to big government.